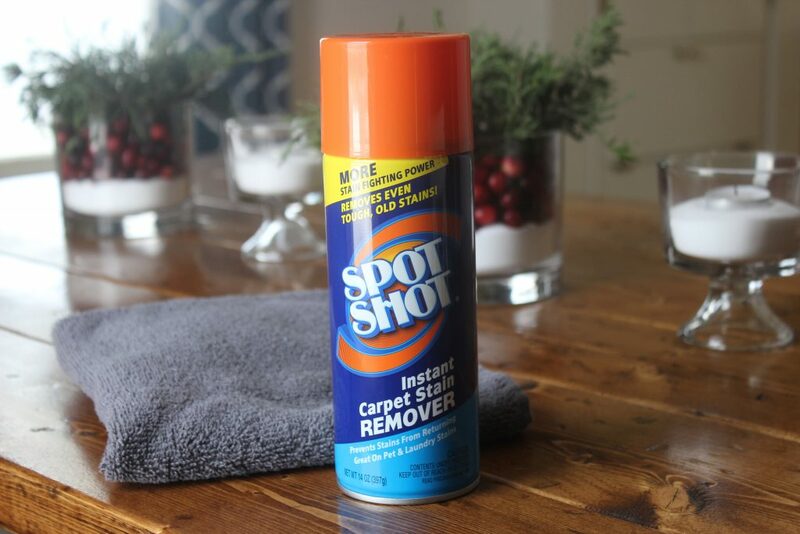 Shoutout to Spot Shot® Instant Carpet Stain Remover for sponsoring this article. All the opinions below are my own, and I only recommend products that I use and think will benefit others! If there is one thing I love about Christmas, it is all the stunning decorations that are to follow. All things glitter, Santa themed, reindeer, I mean what isn’t there to love! In that, I started thinking about how to decorate our table this year! I wanted to share a quick 5 minute Christmas table centerpiece that you guys might enjoy for your dining table! Best of all it is very affordable, so a few basic supplies are all you need for a modern centerpiece to greet your guests as they sit down for your holiday feast. Holidays are stressful, so having a quick dining table Christmas centerpiece is a must for me. 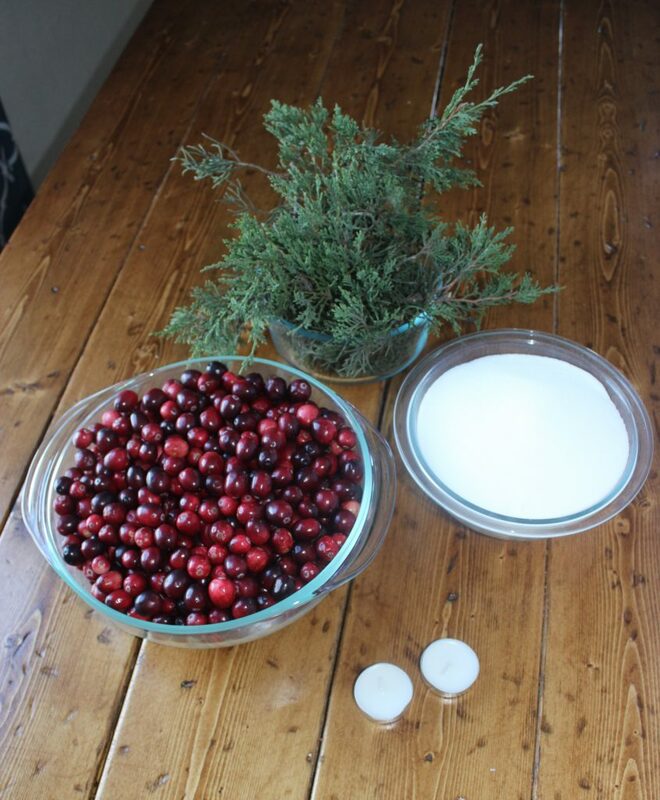 I created this pine and cranberry Christmas centerpiece that takes just 5 minutes. I pulled what I had around the home and created a simple but elegant centerpiece that could work in any home. You can use any glass jars or vases you have; these are ones I had on hand from previous decorating. I think I picked these up at our local dollar store a few years back. You could even take a farmhouse look and use mason jars if you would like. If you have a table runner, use that to add even more color to your dining table. 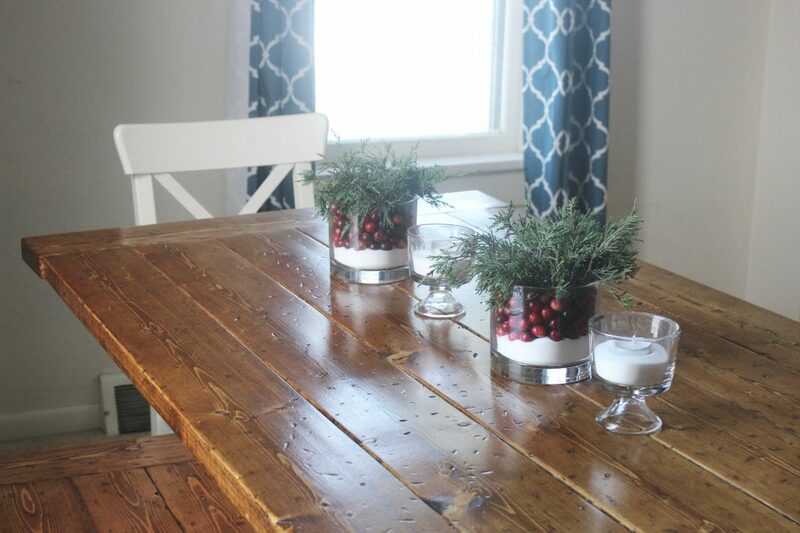 You can gain a lot of inspiration from this natural holiday dining table decorations. 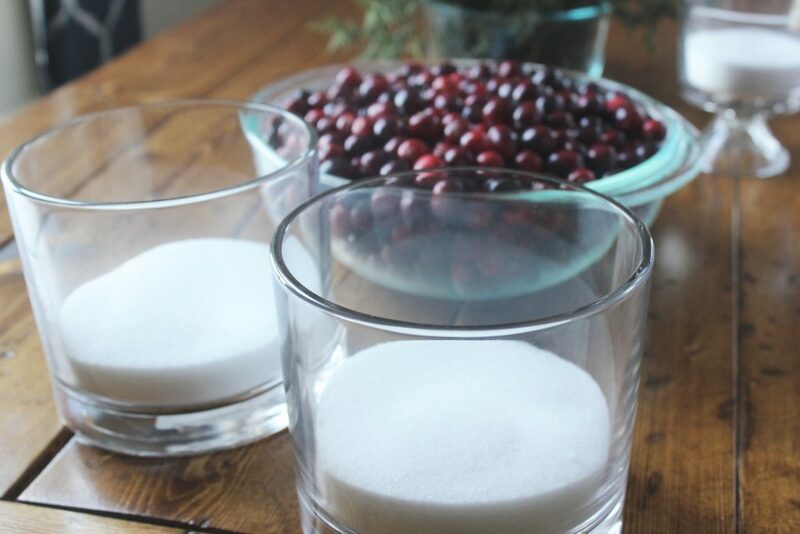 First, start by filling each one of your glass jars with a layer of salt or sugar in the bottom. As you can see, I didn’t add a ton in each glass vase, just enough to see it in the bottom. 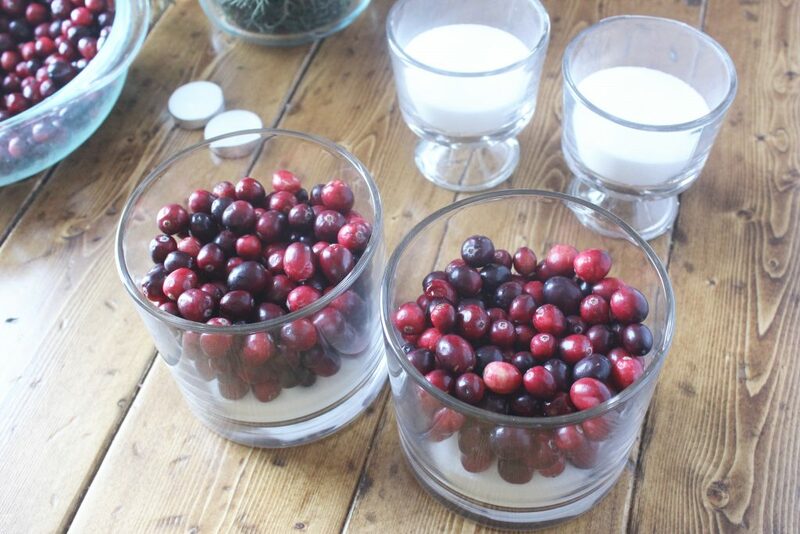 Then add a layer of cranberries to the jars. I left a little bit of room for the evergreens to go on top. Lastly, I put in some evergreens on top that I picked off one of our trees in the yard. I also added tea light candles to two of the vases, and that was it. 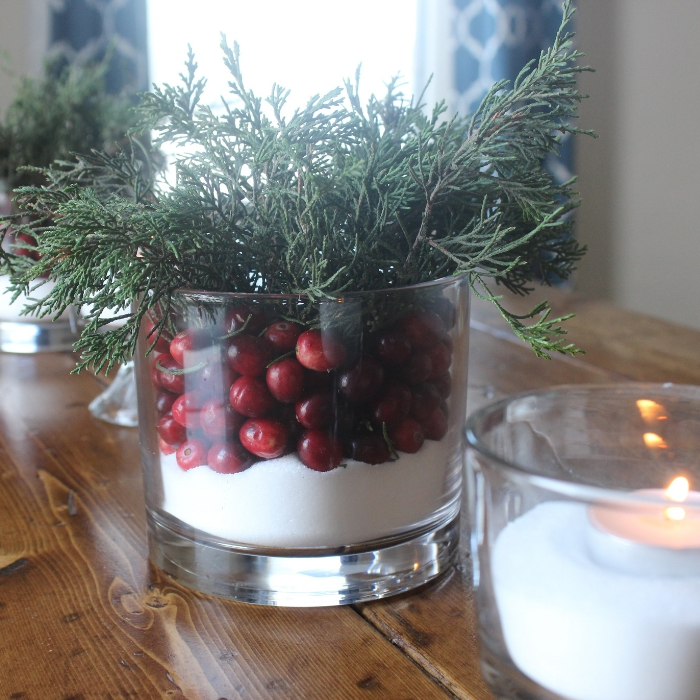 Not much goes into this centerpiece, but it can give you that holiday vibe instantly. 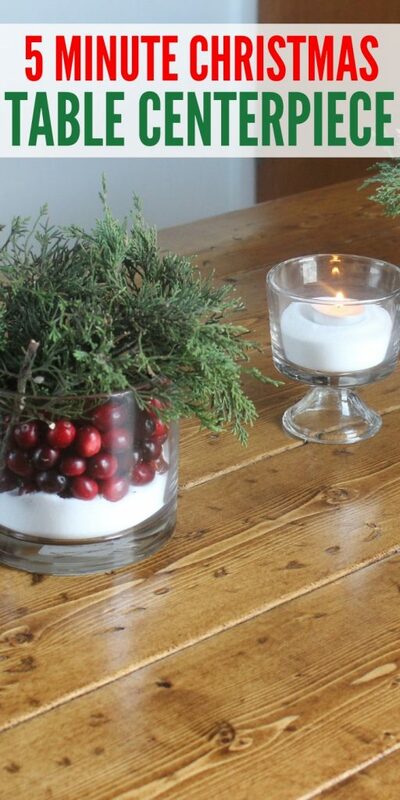 Add your personal touches to make this holiday table decoration fit your home and style. Now that you have your stunning setup for your dining table, now let’s talk about when the party leaves! I love hosting parties but boy the cleanup can be a chore! From cleaning up stains from guests spilling or tracking in mud and dirt, to getting all that glitter picked up from your gorgeous decorations. Let me help you to master the holiday cleanup. If you are the type that has a live tree and you go to toss it out or plant it in the yard when Christmas is over, you might end up with tree sap on your clothes or carpet. Just take a soft cloth and add some rubbing alcohol and dab over the area that has sap. It will get rid of that insanely sticky mess instantly. Our home is full of glitter during the holidays from ornaments, ribbons, and decorations all over our house. I found this trick a few years back and have done it ever since! Grab a lint roller or even tape, and use it to pull up any glitter. 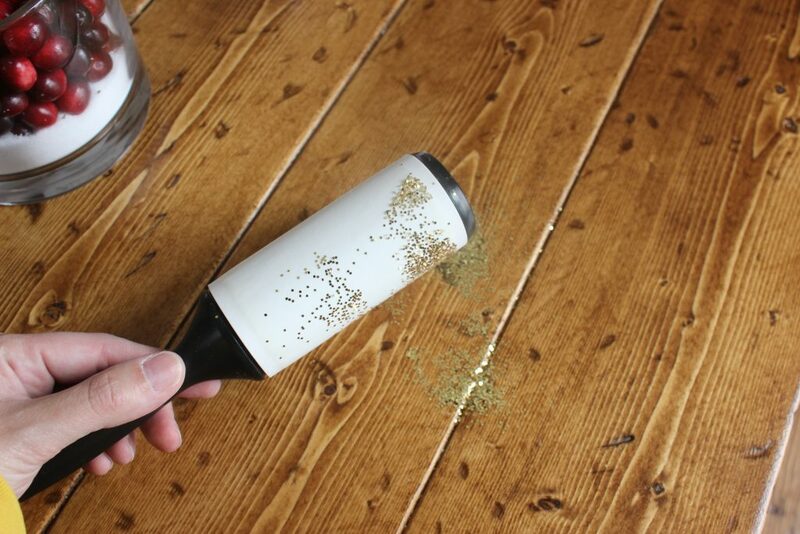 The lint roller is excellent for picking glitter up off furniture, clothing, and even the carpet. Glitter seems to get everywhere in our home, so I always have a few lint rollers on hand. Invest in nice sturdy trash bags. Ensuring your bag won’t break is a must! I also use multiple trash cans and then add a big label to each. I do this so everyone knows where to put recyclable items and where to throw trash that can’t be recycled. It saves me time later on, and I can keep things organized as to where all the cans are or cardboard from all the gifts. We have a ton of people coming in and out, eating food, and sipping on drinks over the holidays. Any home is bound to get those stains after the party leaves. No matter how much I try, we always end up with a handful of spills along the way. 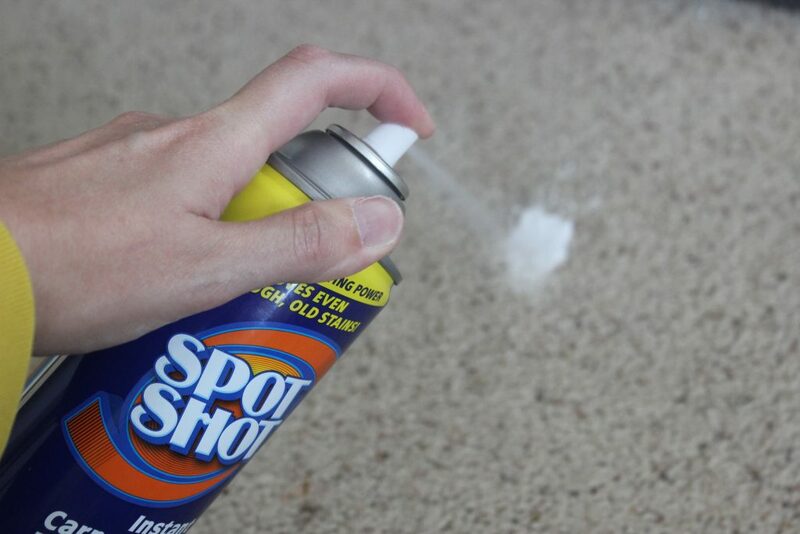 My carpet cleaner of choice is the Spot Shot® Instant Carpet Stain Remover! This stuff works like magic at removing old and new stains from your carpet. A friend told me about this product a few years back when I had a stubborn stain I couldn’t get out. I gave this a try as a last ditch effort, and to my amazement, it pulled the stain out of my carpet. Just spray a little on the stain, let it bubble and sit for a minute and finish cleaning. It works so well at lifting out the stains from the carpet. If you missed a stain that you come across later, don’t worry, it will still tackle that stain like no one’s business! Spot Shot Instant Carpet Cleaner works for old and new stains, trust me keep a can in your cupboard, you will need it! Look for the orange lid at your mass retailers, or head over to Where to Buy on their website to find a store near you! You can also print off $1 coupon to use on your next shopping trip. Be sure to follow the Stain Fighting Community on Facebook for even more great cleaning tips and tricks. Start in one room and get it thoroughly cleaned and move on to the next. I have found I feel more accomplished at the end of the day if I have a handful of rooms fully cleaned. Toss out the trash, vacuum, cleanup spills, wipe down and disinfect, and work at your pace. Create a to-do list if you like to feel organized in that sense and master your home in no time. It also never hurts to have the husband or kids join in to help clean up as well. Do you generally add a centerpiece to your dining room table?